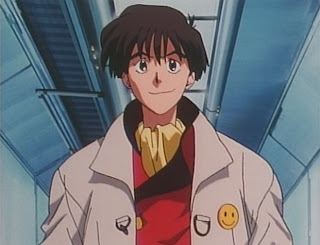 Justy Ueki Tylor (age 20) is a callow youth of uncertain ability in the distant year UC 6999. 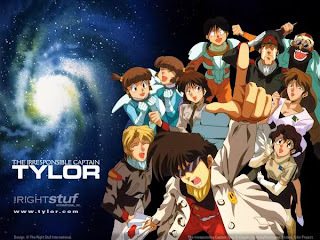 As the animated series known as "The Most Irresponsible Man in Space" or "The Irresponsible Captain Tylor" begins, Justy abandons his life of vagrancy for a cushy job with the military. The United Planets Space Force is only too happy to have him, as they are at war with the Holy Raalgon Empire (brutish pointy-eared aliens up to no good). Tylor speaks his mind (such as it is). He's far too laid back. He has no regard for rules or protocol, breaks the computer assigned to classify him, and is, in short, deeply unsuited to the military life. So he is rapidly promoted. I got quite a fair few chuckles out of this show. It's a space opera in the style of Star Trek, but with more than a hint of irreverence. Tylor is virtually impossible to dislike: he treats EVERYBODY fairly. He's relaxed to a degree I cannot achieve personally without chemical assistance. He MIGHT be defined as irresponsible, but it may also be right to call him carefree. Tylor has a live-and-let-live outlook, it's such a delight to me when retired old Admiral Hanner takes a liking to the guy. For his was a genius no rule could contain!